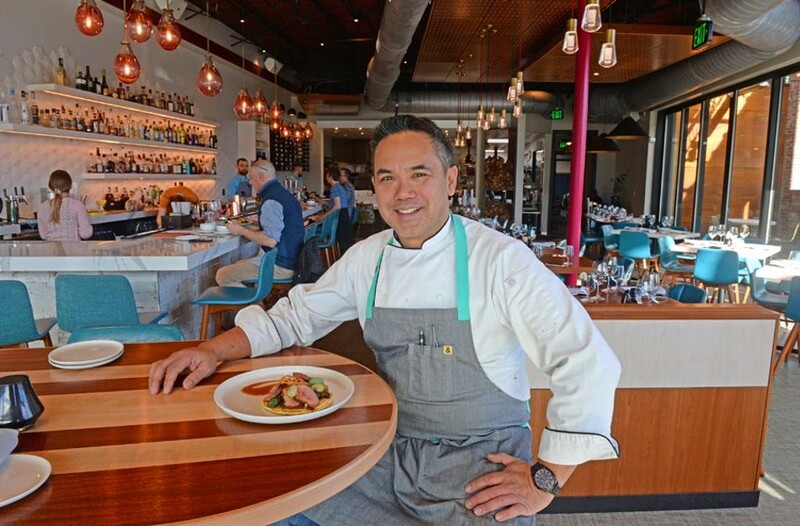 Philippine Fusion: Mike Ledesma perches on the edge of greatness | Food and Drink | Style Weekly - Richmond, VA local news, arts, and events. Scott Elmquist Mike Ledesma’s first restaurant, Perch, serves an expansive menu in a bright, airy space. At Perch, chef and owner Mike Ledesma layers his Philippine heritage onto a wide range of seafood-focused dishes. The cocktail program is satisfyingly complex without being overwhelming, the decor is pitch-perfect with personal details, but overall the restaurant feels like it is trying to cover too many bases. The building, former home to Chinese institution Joy Garden, has been completely redesigned in relaxed Hawaiian chic, a nod to Ledesma's culinary training in Oahu. The vibe created by architect David Johannes and designer Helen Reed includes good lighting, beachy colors, an open-air patio and a bank of front windows doubling as a sidewalk dining counter. These details invite the outdoors into the airy space and reflect Ledesma's friendly, open personality. With the room full, we were able have a conversation without shouting, and the side parking lot is a welcome rarity in the trendy Scott's Addition neighborhood. The bar at Perch is long, comfortable and bright, and the cucumber-citrus Get Schwifty is my current favorite gin drink in town. The extensive wine list includes local beers, a few Virginia and natural wines and several sakes. Bar and table service is attentive and friendly, with knowledgeable explanations to menu questions. On the menu, starters range from $8-19, and when we dined included Philippine-inspired specialties like the arroz caldo soup, a comforting lemony blend of creamy rice, chicken and soft egg. I'll be sending out for this soup the next time I'm sick. The crispy lumpia, a small rice-paper roll, was a perfect small plate — hot, crunchy, salty and full of local Autumn Olive Farms ground pork. We devoured the mussels poached in rich lemon grass-tinged coconut milk. The Asian-inspired main courses are the most interesting and best executed, with all entrees costing about $25. The shrimp tamarind bouillabaisse had just enough sourness from the tamarind to enhance the broth's delicate flavor without overwhelming it, and our shrimp were perfectly cooked. The delicious vegan crabcakes incorporated hearts of palm, an appropriate-feeling Hawaiian addition that mimics flaky lumps of crabmeat. The mix of palm, chickpeas and nori was held together by aquafaba, the canned chickpea liquid also used to make vegan meringues. The house-made kimchi was crunchy and tangy, with a satisfying hit of chili. In a bold move, and probably a Richmond first, Perch has rolled out the occasional serving of Spam, the beloved Hawaiian meat that enhances things like sushi, fried rice and noodles dishes. Sadly the canned meat wasn't on the menu the three times I ate there, but this is exactly the kind of unusual culinary reference I loved from Ledesma's pop-ups. Perch's large kitchen is open to the dining room with a counter. There, as many as six guests can order a special chef's menu: a multicourse meal of small plates, each created by the chef based on diners' food preferences. At $200 per diner, it was too pricey for our budget, but we were intrigued by the nine to 11 customized courses with paired drinks and wine. Look a bit closer at Perch, and some odd details emerge. The division of the restaurant into zoned areas so that guests can "perch" in different areas was part of the idea behind the design. But the choice is a little overwhelming — seating options include a side patio, a chef's counter facing the kitchen, a long bar, an outdoor eating space, a large private event space, booths, tables and a communal bar table. Choosing a seat also means deciding between several chair styles, table sizes and table shapes. The menu offers a similarly wide array of options. Rather than go all-in on Ledesma's signature mash-up of Philippine, Hawaiian and Japanese flavors, the menu includes outliers like venison, rabbit, pizza, foie gras, duck and charcuterie. A few varied options make sense on any menu, but there are places in Richmond well known for many of these dishes, and they aren't the food I would head to Perch for. It's as if Perch was built on a trend list: Wall murals, check. Pizza oven, check. Game meats, check. Pimento cheese, check. Open kitchen, check. Patio, check. Brunch, check. Kale, check. Rather than being a confident entry into Richmond's dining scene, Perch feels more like a bet-hedging version of Ledesma's vision. Fortunately, it's there if you dig for it. Saturdays 4 p.m. – midnight. Sundays 10 a.m. - 2 p.m.; 4 p.m. - 9 p.m.